Tim Sweeney says the studio's future lies with free-to-play fare like Paragon. Epic Games is probably best-known for creating the sweeping, (relatively) story-driven blockbuster Gears of War. But those big-budget days may be over: CEO Tim Sweeney told Polygon that the studio's future more likely lies with games like Paragon and Fortnite—which is to say, free-to-play, multiplayer fare. Sweeney said that the cost of big-budget games "forces developers to work with major publishers to succeed," and following the release of Gears of War: Judgment, Epic decided to change its approach. "We were seeing some of the best games in the industry being built and operated as live games over time rather than big retail releases," he said. "We recognized that the ideal role for Epic in the industry is to drive that, and so we began the transition of being a fairly narrow console developer focused on Xbox to being a multi-platform game developer and self publisher, and indie on a larger scale." 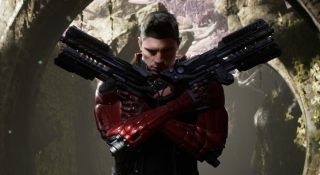 Things have been quiet on the Fortnite front for quite awhile now, but Paragon's been getting a serious push—a free beta weekend is now underway—and, lest we forget, the Unreal Tournament reboot is a free download, and so is the Unreal Engine 4 SDK. It seems clear that Epic is committed to this path, then; what's less clear is how much the future actually belongs to free-to-play. It's been a path to salvation for a number of struggling MMOs in recent years, but Trion recently switched Atlas Reactor from free-to-play to a “premium digital” release, saying the F2P model would have forced it to compromise its vision for the game, and Cliff Bleszinski's Boss Key Productions did the same in March with its upcoming multiplayer FPS LawBreakers.